Caption slip reads: "Photographer: Miller. Date: 1961-09-06. Reporter: Hinman. Assignment: Huntington Harbour development announced. At a Wednesday press conference in the Biltmore, plans for a new Huntington Harbour marina --l uxury housing development were announced. 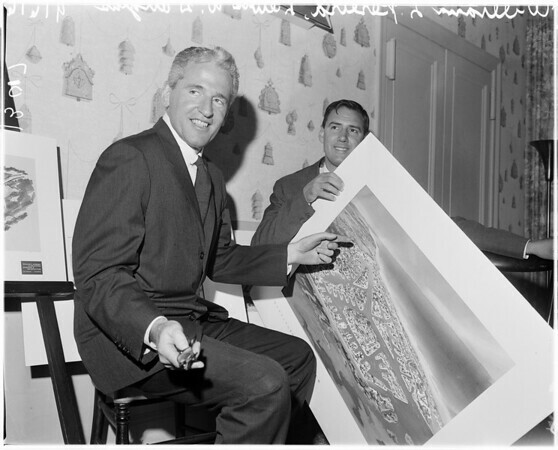 Holding a land-use drawing is William L. Pereira, planner. Watching is Lewis W. Douglas Jr., president of Christiana Oil Corp., which owns Huntington Harbour Corp.".